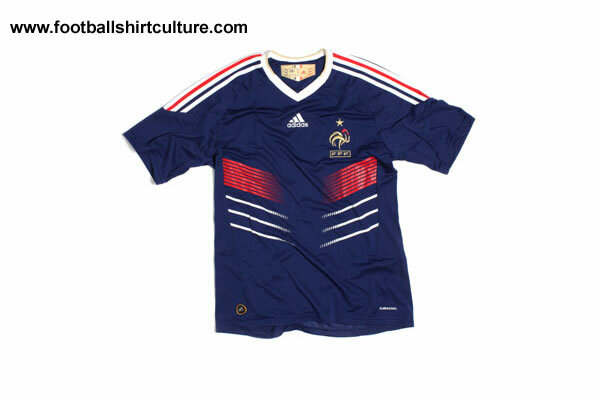 This is a leaked shot of France’s new home kit for 2010, according to www.footballshirtculture.com – so if the French beat the Rep. of Ireland in next month’s playoffs, this is the shirt that Franck Ribery and co. will be wearing in South Africa. Meh. I’m not a big fan. The ‘three slash’ chest detailing seems like an unnecessary afterthought, and it clashes with the retro styling of the shoulder stripes (ooh, get me!). I assume it’s partly a tribute to the classic kit sported by Michel Platini in the mid-Eighties, but somehow it’s not a patch on that. i don’t understand why the french, for all their “sophistication and style”, always have such ugly kits. Would’ve looked classy without the ‘ribcage’ detail on the front. wont be seen in south africa anyway so who cares! Cullo, I see what you did there – like your confidence! That’s absolutely horrible. I’d say it’s on par with the Chelsea bicycle kit or Bolton’s monstrosity. International superstars such as glenn whelan and keith andrews will show henry and benzema how its done!! I’m frech, and I do agree with all your comments guys ! It looks like Wolverine has had a go at the front of it. Would have been great without that. Looks like a strange combination of cat scratch fever and their “look into my eyes” hypnosis white jersey from 2006. Cela fait penser a l’époque Aimé Jacquet ! Bien les kikoos ricains ? I’m french, supporter of my national soccer team but this kit is probebly the most ugly of french soccer history ! I think I hate this kits more than french about Domenech…. What’s that chicken doing on the shirt? This shirt would great on coach watching the Republic of Ireland on TV ( SA 2010). Hi guys … let’s come back on this kit on 19 Nov … if necessary. This is the last shirt from Adidas, at least until 2018. Nike has bought the rights for the 2010-2018 period for 42,6 MILLION EUROS A YEAR + BONUSES (yeah that’s the world record). Here, Adidas’ three lines are everywhere. Perhaps some stragegy to make the Nike shirts, which can sometimes lack personality, be hated even more and Adidas be reclaimed. i am french and this kit doesn’t matter since We’ll be beaten by ireland 3-0 at croke park and france will win 2-0 in Paris….mark my predictions. Not keen on this one and im sure the Irish will truly hate it after Henrys shenanigans. While I have admired Adidas for a long while, I feel that just recently as a business they have gone off the boil. Their design is not what it was and IME, the standard of the manufacture has gone downhill. They used to be the best, today they’re just the cheapest trainers.